Rabbi Aharon Sorscher learned in Yeshiva of Staten Island and then learned in Beth Medrash Govoha in Lakewood, NJ for many years. He served as a Rosh Chabura of the prestigious Dirshu Chaburah, as well as Bochen (examiner) for the new applicants to Lakewood Yeshiva. He is currently living in Southfield, MI where he is studying in the Kollel. 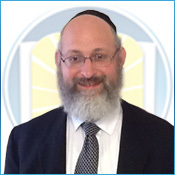 He is also associated with the Yeshiva Gedolah in Detroit, and gives shiurim and guidance to the Kehillah of Cong. Yagdil Torah.